From time to time, people ask me how St. David’s, Peters Township, is doing. The diocese does not always give us updates, not even when there are significant deployment changes. We are likely to get even less news next year, for which there are significant cuts to the diocesan communications budget. St. David’s, whose congregation left the Episcopal diocese for the Anglican diocese and then returned the property with but a skeleton congregation, seems to be doing pretty well. St. Paul’s, Mt. Lebanon, which had been helping St. David’s in its efforts to become a healthy, mainstream Episcopal parish, today held a reception for the Rev. Kris McInnes, who is shedding most of his duties at St. Paul’s to become the sole priest-in-charge at St. David’s at the start of the new year. In May of 2012 we entered into a companion relationship with St. David’s Episcopal Church in Peters Township. When the property and a remnant of the congregation returned to the Episcopal Church, St. Paul’s agreed to a two-year relationship in which Kris and I would serve as Priests-in-Charge of St. David’s to work with its members to help heal and rebuild the parish. In exchange for our help, the Diocese agreed to provide funding during those two years for half of the cost of an Assistant Rector for St. Paul’s, thus allowing us to call the Rev. Michelle Boomgaard on a full time basis rather than a half time basis. Rebuilding has gone well at St. David’s, due in large part to the hard work and commitment of Kris along with the members of the congregation. In 18 months St. David’s has grown to the point that it is larger than the average parish in the Diocese, and is well on its way to self-sustainability. Therefore, the Bishop and I, in consultation with Kris, have decided that effective January 1, 2014, Kris will become the sole Priest-in-Charge at St. David’s on an almost full time basis. He will continue a limited role at St. Paul’s as Assisting Priest, helping with occasional 6 pm and 8 am services and some pastoral care. Michelle will become our Associate Rector. The funds that the Diocese has been providing to help with her compensation will be redirected to St. David’s to help them provide Kris’ compensation. This is a significant moment in the life of the Diocese, St. Paul’s, and St. David’s. We can be justly proud of our contributions to bringing St. David’s back to health and vitality. We can also be proud of having nurtured Kris in his journey from Curate to Assistant Rector to Associate Rector and now Priest-in-Charge. We will miss having Kris with us as much as we would like, but we can feel good about our contribution to the larger Church. We are very fortunate to have the services of Michelle who has become such an integral part of St. Paul’s over the past 18 months. Kris will be preaching and celebrating at the 8:45 and 10:45 a.m. services on December 8. Please join us for what will likely be Kris’ final appearance at our main Sunday morning services. There will be a special reception in Kris’ honor between the two services. Please also consider making a contribution toward Kris’ St. David’s Discretionary Fund. Discretionary Funds are used by clergy to assist people in need in the parish and the community. You may write a check to St. Paul’s Episcopal Church with “Kris” noted in the memo line. You may not have heard that as of January 1, I will become the sole Priest in Charge at St. David’s and take on a very limited role at St. Paul’s as a pastoral assistant. This will make me full-time at St. David’s. I am so very happy to be able to make this move and I am confident it is where God is calling me to be. When I started helping out at St. David’s I had some mixed feelings about coming home to the parish where I grew up. At the same time, I knew that St. Paul’s was in the best position to help the continuing parish of St. David’s and I welcomed the opportunity to help rebuild. In the year and a half since, we have seen tremendous growth and vitality return to St. David’s and I have found myself falling in love with this place and this community all over again in new and exciting ways. Last year at this time the congregation was half the size it is now and there was tremendous uncertainty surrounding the future of our life together. Now, a year later, we are are stronger and more confident in our identity and mission. A year ago, almost all of our Lay Eucharistic Ministers, Lectors, and Altar Guild members were volunteers from St. Paul’s. Today we have a corps of about a dozen parishioners who fill these roles (and we are always looking for more who would like to join in). A year ago, the community garden was just an idea and today we look back on a harvest totaling almost 600 lbs of fresh, organically raised produce. Add to this the wonderful Acolytes that serve at the altar each week and the ever growing praise band and choir and we have a recipe for a bright future together. There are such wonderful, loving people who call St. David’s home and I look forward to inviting many more members of the community to come and join the great worship and mission we have here. I couldn’t ask for a better group of people with which to share in the work. St. David’s is not yet self-supporting, but it is well on its way to becoming a stable parish. The diocese and the clergy and laypeople of St. Paul’s have been important in bringing St. David’s this far. A significant factor in the success of this enterprise has also been the small cadre of parishioners who chose to return with the physical plant to The Episcopal Church. Not every property that has been returned to the diocese has benefited from the availability of a priest who is a son of the parish. I suspect that Kris’s connection to St. David’s was critical to the progress made there. Moreover, as Lou Hays implied, Kris has matured as a priest since he first came to St. Paul’s. 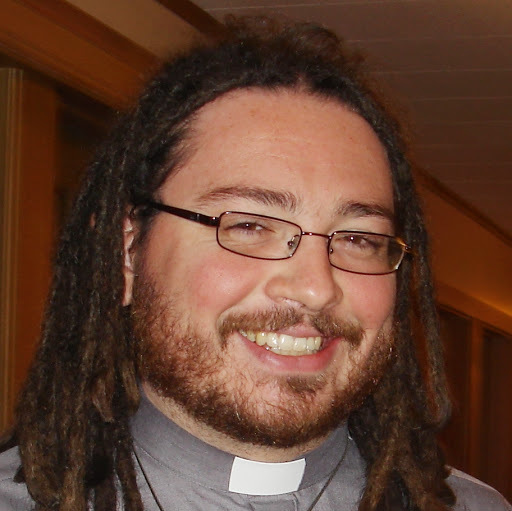 There was reason to have doubts about the young priest in dreadlocks when he first came to St. Paul’s. His early sermons seemed to be informed more by the Internet Movie Database than by serious biblical scholarship or theological reflection. His farewell sermon today at St. Paul’s dispelled any residual doubts as to whether St. David’s was being left in good hands, however. We should all be grateful for the ministry of the Rev. Kris McInnes and wish him well in his new position. Dreadlocks on a white guy? Wow-what's next-tattoos?